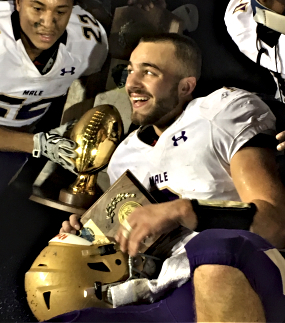 Male senior quarterback Garrett Dennis enjoyed the spoils of victory after leading the Bulldogs to the Class 6A state title Friday night. Male High School has been playing football for 125 years, and in that time it has won almost 900 games, had 9 undefeated seasons, and since the playoffs were instituted about 60 years ago, the Bulldogs have claimed 8 state titles. Male has produced its share of big-name stars, including in the last 25 years a trio of Mr. Football winners (Michael Bush, Montrell Jones and Douglas Beaumont), and a pair of record-setting quarterbacks (Chris Redman and Gerry Ahrens) who led the Bulldogs to state championships. But you would have a tough time convincing current Male Coach Chris Wolfe that any of those legendary players were any more valuable than Garrett Dennis, the senior quarterback who carried the Bulldogs to this year’s title. Just as he has been all season, Dennis was the main man as Male mashed Scott County 37-20 in the Class 6A finals Friday night at Kroger Field. He rushed 30 times for 188 yards and three touchdowns, and completed 10 of 13 passes for 113 yards. For the season he ran for 1,122 yards and 17 TDs, and threw for 2,491 yards and 34 TDs. Listed at 5-foot-11, 160 pounds, Dennis is tougher than barbed wire and has a heart as big as a canyon. Male Coach Chris Wolfe led the Bulldogs to their second state title in four years. Case in point: Midway through the fourth quarter Dennis was shaken up and limped to the sidelines. He sat out exactly one play before returning to action. A minute later, on fourth-and-seven, he took a snap on a fake punt and fired a 20-yard pass to Izayah Cummings. That led to the final, clinching TD of the night. Because of his size, Dennis hasn’t drawn much attention from college scouts. Wolfe said that’s a mistake, noting how Dennis has shredded top-quality competition. Male is saying a lot by winning its second state title in four years. When Wolfe took over as the Bulldogs coach in 2010, he heard a lot of talk about how difficult it was for public schools to compete against the private powerhouses, Trinity and St. Xavier. “I said we’re not going to talk public and private. 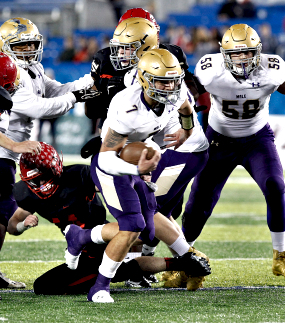 We’re just going to do our business and we’re going to get it back to where it’s competitive again, so it’s not a foregone conclusion that (Trinity and St. X) are going to win it every year. Charlie Kuhn coached Male to three state titles (1960, ’63, 64), and Bob Redman guided the Bulldogs to three championships (1993, ’98, 2000). Wolfe said he feels “honored” to be mentioned in the same conversation as those icons. “This is a dream job. Everybody at the high school level aspires to coach at a program like this. We have a great staff and incredible student-athletes. Garrett Dennis ran for 188 yards and 3 TDs, and threw for 113 yards against Scott County.